“Oh Crimini!” Is it Crimini or Baby Portobello or Button or Portobello? Where have I been and maybe you too? News flash: white button mushrooms, when allowed to grow, become Crimini mushrooms, which if allowed to grow even further, become Portobello mushrooms. And what happens when you chop them up? They all look the same. 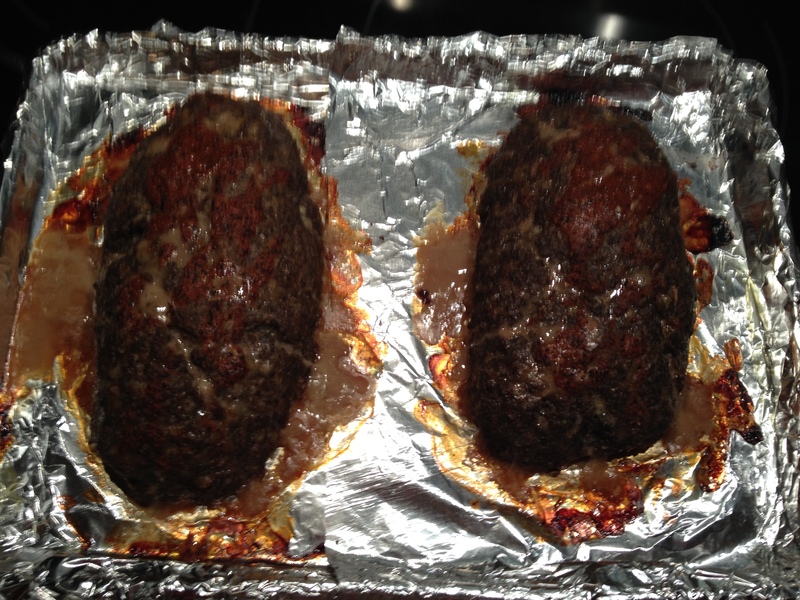 So I made two meatloafs: one with the crimini mushroom and the other with the white button mushroom. Both of these recipes made with very lean beef and mushrooms replacing 1/2 the meat in the traditional format, are a much leaner version than the 1950’s man version. The flavor is a bit more intense in the more aged mushroom, but depending on your taste buds, you may or may not tell the difference. My husband Dave, a meatloaf connoisseur, insists the crimini mushroom meat loaf is more flavorful, in a good way, than the white button mushroom meat loaf. I can not tell much of a difference, but then, I am not a real mushroom fan. It’s one of the very few foods I don’t like. It all relates to getting sick once……. Preheat oven to 375 degrees. Cover a baking sheet with foil and spray with oil lightly. Place half of mushrooms in food processor to mince. Repeat with the remaining half. Do not process all at once. Heat a large skillet over medium high heat. Add 1 Tablespoon oil and swirl to coat. Saute onions until tender. Add garlic and sauté 1/2 minute, stirring constantly. Add mushrooms and cook and stir several minutes until liquid evaporates and mushrooms slightly brown. Add sherry and thyme and cook 1 minute, stirring. Remove from heat. In a large bowl combine panko, salt, pepper, beef, egg and mushroom mixture. Combine thoroughly. I use my clean hands. Shape the meat loaf into an oval on the prepared baking pan. Bake for 20 minutes. Brush top with hot sauce or ketchup. Bake another 10-15 minutes or until an instant read thermometer registers 160 degrees. Slice into 1 inch slices. Serves 6-8. Thank you Cooking Light Magazine for this inspiration. Posted in main dishes and tagged baby portobello, crimini, lowfat, mushrooms. Bookmark the permalink. I’ll be making this tonight! It is not the greasy meatloaf I grew up with, but very fresh, light and meaty! I made this recipe today! It turned out great. Instead of meatloaf, however, I made meatballs. You may remember that I have been in a meatball mode since my daughter, Katie, took me to the The Meatball Shop in NY last summer. So, I just followed suit and baked the meatballs for 20 minutes. They were really tender! Part of the benefit of meatballs is that they keep in the freezer really well. It turns out to be a fun appetizer for company and a great meal for two people. It never feels like we are eating leftovers as the meatballs keep their shape and flavor in the freezer. Great idea! Bite size meatballs would be great to keep in the freezer! Next time I will do that!